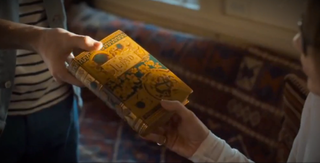 Apparently somebody went to see The Boy Next Door, because a bunch of people are trying to find that "first edition copy of the Iliad," a three-thousand-year-old work derived from oral tradition. That's according to Richard Davies at online bookseller AbeBooks (h/t the Paris Review), who writes that, "Since Lopez's latest movie, The Boy Next Door, was released in the US on January 23, 'The Iliad, first edition' has been the top search term on AbeBooks.com." In fact it's beating To Kill a Mockingbird, despite the great honking upswell of renewed interest in Harper Lee. They're out of luck, though: "I cannot match the book seen in the movie to anything currently for sale on AbeBooks and I did trawl though several hundred listings yesterday. It could be a movie prop." Also, #actually, Mr. Davies says the exchange in the movie is TECHNICALLY correct, because "there have been numerous editions of The Iliad printed since the 16th century and each new edition would have its own first edition, so in that context the movie's dialog is actually correct." Yes, I'm sure that's exactly what they meant.